I am a daughter of immigrants. My mother is Norwegian, from the small southern island of Notteroy. She was a teenager during WWII, when Norway was occupied by Germany. My father was born in Alexandria, Egypt, the youngest of nine children. His ancestors were from Luxor along the Nile River in Upper Egypt. We have all heard how President Trump defines these countries. Norway is acceptable. Egypt is not. But all evidence shows the first people, and therefore all people migrated through my father’s ancestral back yard. We are one family of humanity. We must not allow divisions in ethnicity, religion, gender, culture, and politics. If we succeed, a safer world for our children and our grandchildren will be built. It will be a world based in peace, and upon guaranteeing social justice. Our world can be one of hospitable countries, each striving to provide the basic resources of safety, food, water, shelter, education, medical and work for its own inhabitants. My parents’ story: My father received his PhD in Organic Chemistry at University of Glasgow. My parents married in a Presbyterian church in Scotland. They came from different ancient indigenous cultures but shared English as a second language, a love of outdoor life, and a sense of adventure. 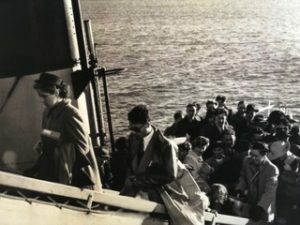 In 1951 they boarded a ship bound for the United States. They left behind their families and countries. They landed at Ellis Island with 10 dollars. My father had secured a research teaching position at the University of Southern California. He had to ask his new employer for an advance against future wages to pay for the train ride from coast to coast. Later, my parents moved to University of Wisconsin for my dad’s post doctorate work in Madison. But they were required to leave the country when his visa expired. He was able to study/work at McMaster University in Hamilton, Canada. I was 2 months old at the time. They moved back to the U.S. after he landed a job as a research chemist in St. Louis. I was now 2 and spent my formative years there. My mother and father became U.S. citizens which took several years. Throughout their lives, my parents showed great resiliency, determination, courage and endless depths of hope and the energy it took to provide a good life for me and five brothers. For this and so much more, I am eternally thankful and grateful. During my youthful life’s pursuit of education, good work, close family, friends, and world travel, I was taught the strong cultural values of my parents’ own traditional upbringings. These values have instilled in me the choice made early on for public service and the charitable work I am fortunate to be able to do today. My personal charter has been to stand up for what is right, to promote human rights, and most especially children’s rights. This begins by showing love and compassion, common decency and respect. We must learn from ours and other’s heritage and value all cultural differences. All human beings must be seen through their connections to us and then through the filter of respect and care that all deserve. My daily affirmation is to live this respect for others through the lens of love and compassion and conscious common-sense problem solving. If my parents were alive today they would be angered and ashamed at how this President and Congress are treating our immigrant families and their children, the babies, in the name of country and religion. It stunning to see the inhumanity of actions taken by a nation of immigrants against immigrant families. This must end now. Please read the recent editorial by NY Times and the editorial board’s suggestions. Take a stand to show the world and our communities how to we can define ourselves as a global community which values all human beings. These are my personal thoughts and the shared values reflected by the work of our charitable foundation.